Long revered as a symbol of love and sensuality, lychee is the ideal scent to ignite the passions of the heart. Just one sniff and you will be addicted to love! 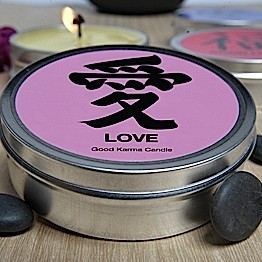 Available as a 4oz shallow travel tin, get connected to the energy and transformational qualities of the Good Karma Candle. Influenced by Zen thought, the brush strokes of each kanji are focused on simplicity, beauty, and most importantly, mind body connection. With the scents and symbols perfectly paired, our Good Karma Candle is the gift of a joyful life!